SANTA MONICA, CA – Internet giants Amazon and Google are slashing prices and offering supposed deals on their “digital assistants” this holiday season, but a study of patent applications associated with the devices reveals plans for massive surveillance of users’ homes, Consumer Watchdog warned today. Consumer Watchdog said that a study of patent applications filed by Amazon and Google with the U.S. Patent and Trademark Office reveals a vision for an Orwellian future in which digital assistants eavesdrop on everything from confidential conversations to your toilet flushing habits to children’s movements and the books on bedside tables. They would know when you go to sleep and whom you wake up with. The patents reveal the devices’ possible use as surveillance equipment for massive information collection and intrusive digital advertising. SNL's Weekend Update made light of these revelations. Read the study of Google and Amazon digital assistants and patent applications here. “Instead of charging you for these surveillance devices, Google and Amazon should be paying you to take one into your home,” Simpson said. Digital assistants can be “awake” even when users think they aren’t listening. The digital assistants are supposed to react only when they “hear” a so-called “wakeword.” For Amazon Echo it’s “Alexa” and for Google Home it’s “OK, Google.” In fact, the devices listen all the time they are turned on – and Amazon has envisoned Alexa using that information to build profiles on anyone in the room to sell them goods. Amazon filed a patent application for an algorithm that lets the device identify statements of interest— such as “I love skiing,” — enabling the speaker to be surveilled based on their interests and targeted for related advertising. The devices can connect to other internet-enabled home systems to monitor your family members’ habits and infer what they’re up to, such as when your children are engaged in mischief. A Google patent application describes using a smart home system to monitor and control screen time, hygiene habits, meal and travel schedules, and other activity. The system even claims it can “infer mischief” based on audio and motion sensor readings from rooms where children are present. Silent children who move are inferred to be mischievous. The devices are envisioned as part of a surveillance web in the home to chart families’ patterns so that they can more easily be marketed to based on their interests. 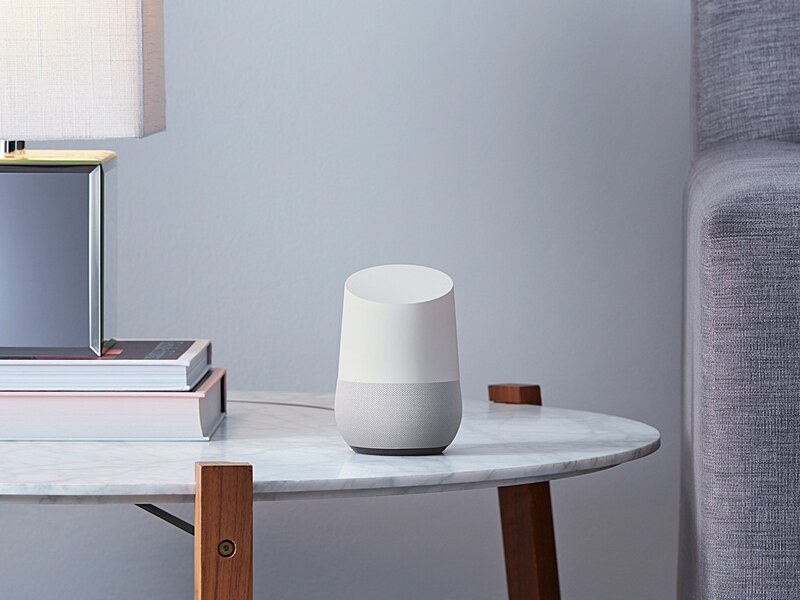 Google connects its Google Home to various “smart” devices such as thermostats and lighting made by another Alphabet Inc. division, Nest. When connected, “inferences” could be made about when occupants are home, sleeping, cooking, when they are in the den watching television, when they shower and when they flush the toilet, according to a Google patent. Another Google patent outlines ways it could collect information about family members’ interests and activities to infer likely purchases. For example, the application describes how sports camp could be marketed to a 15-year-old boy holding a basketball in the living room. It also describes how Google could infer an interest in the actor Will Smith by combining a users’ browser search history with an image on a user’s t-shirt obtained from a Nest camera in the home. It also describes how it could sell you a TV show by spying on a book on your bedside table. “The answers to these questions may help third-parties benefit consumers by providing them with interesting information, products and services as well as with providing them with targeted advertisements,” the patent application claims. Google and Amazon appear most interested in using the data they get by snooping on your daily life to target advertising, Consumer Watchdog said. However, when that information is compiled others could access it. For example, home insurers and utility companies have already made deals with Nest to put smart devices in their customers’ homes. Law enforcement is already seeking information from smart devices. An Amazon Echo made headlines last year when police investigating a murder sought to subpoena recordings made by the device. Investigators in the same case also managed to obtain data from a smart water meter that suggested that the crime scene had been hosed down before police arrived. The study is based on patent applications, which reflect the ambitious thinking of companies’ research and development teams. The fact that a company has applied to patent a concept does not mean that they will implement it. Patents do, however, reflect a company’s ambitions, Consumer Watchdog said, and nothing prevents them from implementing those changes once the devices are in your home. It would not be the first time a company like Google has expanded data collection without obtaining explicit consent from users.